Hope you plan on visiting Glaciar Nat. Park, my favorite after Yellowstone, so far. I also loved Arches, not just the park but the whole surrounding area. Brian & I were their about 4 weeks ago, on our way to Chicago. Thanks for the comments Dave. We did stop at Glacier and loved it. We’ll be writing our post on it pretty soon. How many total miles to do it all? I don’t remember now but I’m guessing somewhere between 4,000 and 5,000 miles. probably more like 8000 miles….we did a road trip from Knoxville TN out I40 east to Las Negas then up to Yellowstone, then cut cross country on several highways back to Knoxville TN and it was 5000 miles…..your trip went into florida which is about 1000 miles on it’s own..
How long did this route take? It took us about 3 months but that was because we spent a few days to a week at a lot of stops. I’ve done a similar route before and it completed it in 12 days. As you would expect, the 12 day trip wasn’t nearly as fun because I didn’t have the chance to really enjoy some of the places. This is amazing! How much did something like this cost? The entire trip around the world (road trip included) cost roughly $25K per person, $50K total. The road trip itself was around $12K, mostly for gas. The road trip was a blast but, in my opinion, it was pretty expensive. Looks like a great trip!!! I did one this summer also.Could you tell me what you used to make the map? I would love to do one of my trip…Thanks for sharing your adventure!!!!! It was pretty low tech. I just downloaded a map off the internet and used an editing program to create the path. You could use Pain, Powerpoint, Adober, etc. Then I saved it as .jpg and uploaded it to the blog. Nothing too complicated. Did you stay in hotels & eat out all the time? What pushed the price up SO MUCH? Gas. Sometimes we stayed in hotels but mostly we camped, slept in our vehicle or stayed with friends and family. If we did stay in a hotel it was usually a cheap one. Gas adds up quicker than you think. Especially on a long road trip like that. Im looking to do a trip very similar to this during the coming Fall. Have you got a list of places you stayed along the way ? any advice on campsites that worked best? Approximately how much did it cost to travel across the country? I think it was about $7,000 total. That covered us for 3 months and the vast majority of it was spent on gas. Keep in mind that we did the road trip when gas was averaging $3.50/gallon. Was the 3 months by choice? Or did it take that long to make it around? You said “us” how many traveled with you? It was my wife (then girlfriend) and I. It took 3 months because we wanted to take our time. Before we began the trip, we committed to driving no more than 4 hours each day, and it was a great choice. I don’t think we would have seen nearly as much had we done it any faster. If you don’t have a lot of time for your trip, my recommendation would be to choose a region and spend as much time there as possible. Thanks! I always recommend more time, but you can definitely do the route in a month. We were fortunate and had the opportunity to take our good ol’ time. We spent 2-3 days, if not longer, at most of the big stops. If you wanted to do it in a month, you could cut the big stops down to 1-2 days each. Wondering how long it took you to reach Washington state? 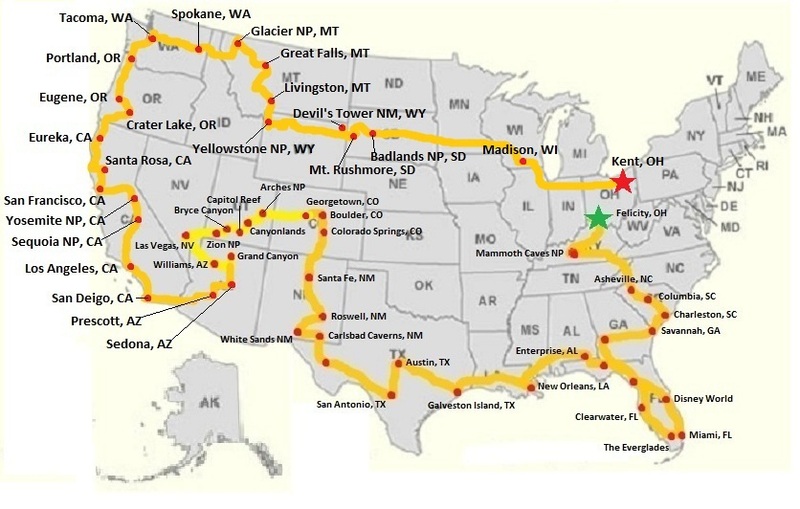 Planning a road trip from Ohio to Washington, and was wondering how many days I should plan for if I used your route. We took our time at each stop so it actually took us a while to get to Washington with our route. The entire trip was about 3 months. I think it took us about 2 months to get to Washington. I’m curious as to why the NE was not in your trip. Great map! It was a timing issue. We had a pre-booked flight out of the country and so had to finish the road trip in order to make the flight. Otherwise, we would have loved to have explored the NE. In fact, we’re planning do a road trip just in the NE in the next couple of years. We’d like to spend 3-4 weeks doing it.